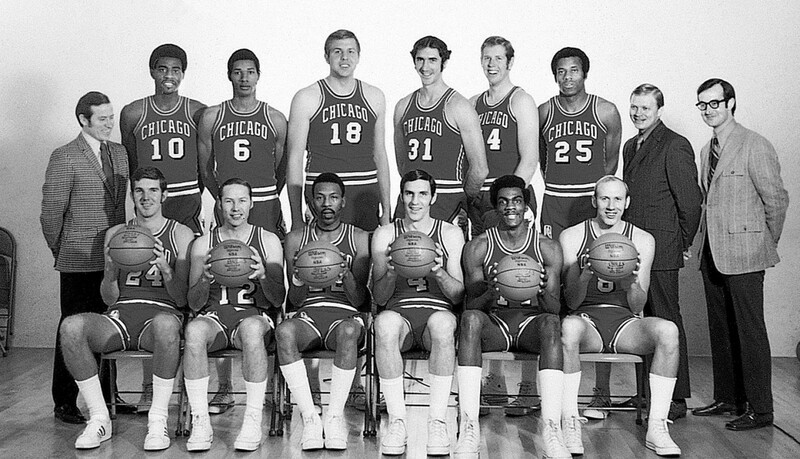 Finished season with 50-plus wins for first time in club’s history ... Boerwinkle’s 33 rebounds led Bulls over Bucks 110-103, snapping Milwaukee’s 20 straight wins (03/09/71) ... Bulls defeated Suns in back-to-back Stadium contests to gain playoff spot ... Love and Walker combined for 59 points in Bulls 116-92 win (03/12/71) ... the following night they combined for 54 points in Bulls 111-99 win ... set team-record 52 assists in 138-121 win over Atlanta (03/20/71). First round, Jimmy Collins (New Mexico State); second round, Paul Ruffner (Brigham Young). Weiss’ 25 points and club’s second-half rally enabled Bulls to tie the Los Angeles series 3-3 with a 113-99 win (04/04/71) ... eliminated 4-3 by L.A. Lakers. Motta named NBA Coach of the Year ... Love named to NBA West All-Star Team ... Love and Sloan also named to All-Defensive Second Team ... Walker led NBA in free throw percentage (.859) ... Love set club record in minutes (3,482) and points (2,043).